This Mother’s Day Gift for Mom or Grandma makes a perfect, unique gift your Mother or Grandmother will cherish forever. She is going to love this one-of-a-kind Personalized Grandma Shirts or shirts for mom featuring all her loving children or grandchildren. Your new Personalized Grandma Shirt is available on our premium white 100% cotton T-Shirt, machine washable in adult sizes S-3XL. Also available in Pink. Our Personalized T-shirts are personalized free. 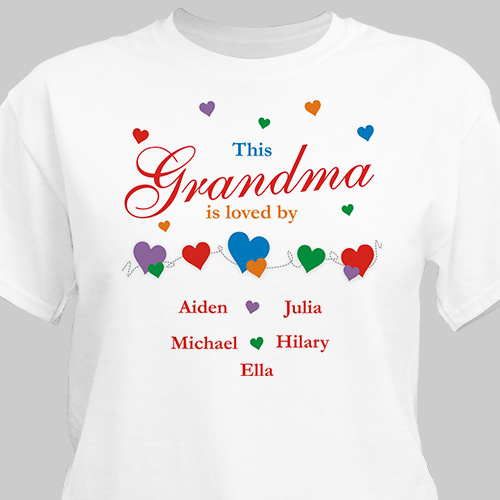 Personalized Shirts for Mom or Grandma can be customized with any title and up to 30 children or grandchildren’s names. Your Personalized T-shirt can have any title: Mom, Grandma, Nana, Aunt Michelle or any special title. Beautiful my granny loved it.